Long shot, but I wondered if anyone had any pictures of the centre when it first opened back in the late 80's (IIRC)? The reason I ask, we were discussing it today at work and one of my colleagues described a food court on the lower level where the escalators are, he vividly described a model train and various independent food outlets, none of which anyone else could remember (we all remembered the cinema and the Indian Restaurant that relocated up the road)?! I first thought he may have been describing the original food court in Orchard Square (bottom level of what now is TK Maxx), but he's adamant it was Crystal Peaks? I remember it, I often used to eat there with the grandchildren. I think it was called the Junction Express. It doesn't seem that many years since it closed. They served a variety of "proper" dinners not fast food and also jacket potatos. There was definitely an LGB model railway layout at the bottom of the escalators, I could never get past it when my two boys were young (I used to make them stand and watch it for ages ). Thanks for the help, I visited the centre sporadically when I was younger, but as I now live at that end of town I've been a very frequent visitor there for the last 6 or 7 years and thought I remembered it quite well. I remember the cinema entrance being where the Sainsbury's now is and the McDonald's being in the same site, I even remember the encased pyrite (fools gold) they had in the entrances, but can't for the life of me remember the train or the food court, which is why I was hoping someone might have some pictures?! Whoever was the developer they were very crafty with the Council's planning department. When I was involved with the setting up of Manor Development Company (MDC) at the back of the shops on Prince of Wales Road, on the site called the "Oppertunity Area" by the council, where it is now built, it was fully earmarked for a large Supermarket. However eventually it became split into two - one half for industrial (hence MDC) and the other for a Supermarket. There was also a condition that the industrial had to be in place before the supermarket was built. So we at MDC worked with a developer called David Rhodes. The plan was to build a Netto on the other half. 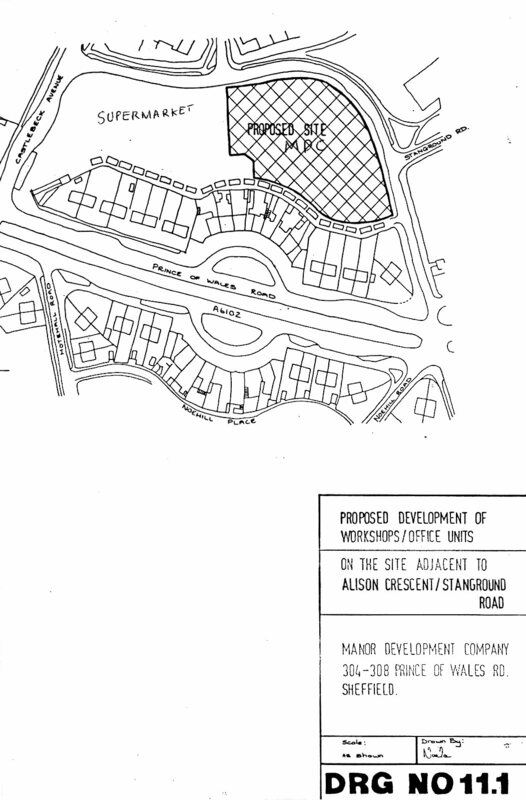 However David did some digging around and discovered that the Developer of Crystal Peak had got the planning department to agree to a clause to stop any development of a supermarket over a certain size being built within a certain area for a good number of years. This included the Manor area. The size of the proposed Netto supermarket, however was not a problem as it was smaller than that allowed. Though if the land had not been split and covered the full area that would have been a problem! Eventually the Council put the land out for bids, so Aldi put in a higher bid for the half of land than what Netto did. David told the Council that they would do this to stop Netto and Aldi had no intention of building there. But the Council never tends to listen to good advice and accepted the higher bid. Netto pulled out, took over the branch at Manor Top and of course Aldi pulled out. Leaving the Council with egg on their faces. Eventually another supermarket got the site which is the one still there today. By the way the agreement over what's built will have run out by now. Talking to David revealed why there are loads of Supermarkets in Sheffield. It's all to with money that the Council can get for derilct land. For example if you want to put housing on it very little money, often done by grant aid. Business max about £40K per acre. Supermarkets £100K + per arce. As I remember it the model railway was larger than the usual oo gauge and was based on a Swiss style alpine railway with log cabins and electric overhead pantograph trains, - the sort of thing that Stuart will know about. In the winter and around Christmas they even used to whiten it to make it look like snow and give it a winter seasonal look. Yes it was that sort of size. If I remember correctly there were 2 sections of rail on the layout. One went round in a continuous track which wasn't round or oval and it had 2 station stops and a tunnel on it. The train that ran up and down the incline also had a working rack system. The one that ran on the loop was often a Krokodil, but as I recall both pantographs were in the folded position and there was no catenary system. Guess what one of my hobbies was for many years? Yes it was a rack system, just as many real railways with steep gradients (eg Snowdon railway) are. Your hobby wouldn't happen to have been model railways by any chance would it? Speaking of Snowdon, anyone see this ? Yes, someone keeps abandoning their car up there. Snowdon nearly got me into a fight with a Welshman once. He asked me what I thought (as one of those hated English tourists) of their "beautiful Welsh mountains"
Now I had noted that these mountains were mainly slate and shale and appeared black, while the Peak District local to Sheffield was mainly limestone and appeared white. "Well, it looks a bit like the Peak District, - but not as clean!" Was this display some sort of reference to its name? The name implies a rocky or ice covered mountain. Why did they call it that? This area of Sheffield / North Derbyshire is relatively flat and certainly not mountainous "peaks"
I can tell you where the name came from. There was a meeting of councillors at which the question of a name came up. At the centre of the complex is a sort of tower with a glass top, and someone suggested calling it Crystal Peaks. Presumably no-one could come up with anything better, so the name was adopted. So the original display that manxbiker describes in post #13 could well be related to the name given to the glass tower. My first job from leaving school was in the food court at Crystal Peaks, I worked there from the first day the centre opened, the unit I worked in was called Potato Junction it sold jacket spuds next to us was a patisserie. A few months after the food court opened a fish and chip shop arrived and there was also a pizza restaurant, we had some right old good times working there. I remember many shifts being seriously hung over having to serve the jacket spuds Yuk !! Welcome to Sheffield History LouLou1970 and thank you for posting. Was the food court on the lower floor near to the cinema complex which is where Sainsburys is now? Yes the food court was on the lower level where sainsburys now is, the food court was to the left hand side as you came down the elscalator directly behind the model train. Does anyone remember Eddie the Eagle Edwards coming to Crystal Peaks, it was either for the opening of the complex or it might have been the first anniversary ? unsure now, anyway he did a simulated sky jump from the top of the dome, think he may have been on a zip line. I remember the food court at crystal peaks but it wasnt there for longbut i cant remember any of the nmaes of the food outlets though,and remember the cinema too,ucI I went to see a fish called wanda there with my mum yrs ago it was a funny film! Does anyone remember the Indian Restaurant that was in Crystal Peaks? We used to go there and then see a film. The cinema closed in 2003 and I don't know what happened to the restaurant or what it was called? Does anyone remember the waterfall feature as installed when the Mall was first opened...also the two lifts...replaced by what someone described as the "ugliest lifts this side of the Urals"...They smartened them up when they received too many complaints. I seem to remember the railway was called "The Glacier Express". The cinema used to give out car stickers "Did ICU at UCI?" I'll just add my bit about Crystal Peaks. yes, teh railway was LGB size. It was in a glass case about 12ft infront of where that pork pie stand is now on the lower level, meaning you walked right by it (with it on your left) as you came down the escalator and headed for the doors or McDonalds. What a lot of people don't remember is a big chunk of Crystal peaks got demolished when Sainsburys moved. The old layout was as follows... When you went in the doors on the lower level (where Sainsbury's is now) the entrance to the Indian restaurant was immedialtely on your right. Turn right and walk past it and you found yourself in a big concourse with a long row of doors across the far end. This was the entrance to the UCI 10 cinema. The box office was a self contained unit right in the middle of the row of doors and you could buy your tickets from the mall side or go through the doors and buy from the cinema side, although i think they stopped using the cinema side eventually. I went to see Blair Witch Project there and on visiting the gents found it full of leaves and twiggs with blood-spattered cubicles and 'help me' scrawled in blood on the mirrors! The food court was exactly where the small food court is now, but it was much deeper and therefore bigger, with outlets on two sides. It closed about the time Sainsburys opened and I seem to remember all the tenants had been kicked out because sainsburys didn't want any competition for their very mediocre cafe. I thought "**** Sainsburys!" and went to eat in the market hall after that. McDonalds was always where it is now. There was also a Blockbuster Video outside at the far end of McDonalds. The Time Cafe was (I think) a Pizza restaurant back then. What I've never known is why the cinema closed? It was a really good cinema and plenty of people went there. I also gave the place a lot of night time business. Cleverly all the night services pixxa restaurant, indian restaurant, cinema, mcDonalds etc were on that lower level, so they used to close the rest of the center but leave that bit open, placing a fence across the bottom of the turned off escalators. It was a great place to go for a night out and I wonder how their takings fell once the cinema was gone and they stopped opening late? And by late I mean LATE! You could often go to see a film at a midnight showing, which was great because kids were banned after midnight. I remember seeing Disney's Beauty & The Beast there in a kid-free environment, which was a great selling point. The theming of the whole place was quite good originally, very much like an American mall with a distinct theme, in this case alpine peaks. We all just accepted it, but looking back the name and theme does seem strange for a place in Yorkshire, so I wasn't surprised when i read above about it just being the best name the council could come up with. The only problem with Crystal Peaks in the early days were the shops upstairs. I remember every second store seemed to be a shoe shop! Great if you wanted a pair of shoes, but useless if you wanted anything else. The whole centre was also much smaller back then. It's encroached onto the car parks bit by bit over the years. The cimema and Indian restaurant was derelict for a while then that whole section got demolished and a new wing in almost the same footprint built to accomodate the moved Sainsburys. Personally I'd rather it was still a cinema! For a time at least the entire development was owned by the Post Office Pension Fund and, maybe, the Cinema was replaced at the expiry of its lease by a tenant willing to pay an increased rent?